After our homestay had come to an end, we then got on a plane to have a week long excursion to Central Vietnam to visit Danang, Hue, and Hoi An. My homestay family is originally from Danang, and still have many relatives still living there. They’ve only driven there once, but they said they left at 8 in the morning and arrived at 5 am the next day. Vietnamese roads, I will not miss you… We arrived in Danang just in time to see the international fireworks competition where we saw Portugal, Vietnam, and Japan’s pyrotechnics. I believe that starting the trip out with fireworks was appropriate, since the entire week was bing bang BOOM full of activities. I also believe that “bing bang BOOM” is an appropriate way to describe much of central Vietnam as it is developing at mach speed. So, central Vietnam? “Bing bang BOOM.” I can’t believe I’m trying to pack everything we did into one blog, because I know that I will fail to give the place the justice it deserves. We first spent a spoiled couple of days in Hoi An at a luxurious hotel with an all-you-can-eat buffet (a nice change from our usual cockroach mating grounds), walking around the stunningly gorgeous streets. Activities in Hoi An include getting clothes tailored, buying endless array of kitschy souvenirs, and eating cau lau (another soup with crunchy crackers and ginger! my favorite). At some nights, they turn off all of the lights and one can set candles lanterns into the river, ride in a romantic boat ride, and listen to musicians who are set up all along the streets. It did slightly kill the mood when you bought your lantern and found a square of Styrofoam in the bottom… It was still a dream tourist spot, and ridiculously stunning. And what other place can you buy knee length, tailor made, purple leather boots? On our way to Danang, we stopped at this place called “Marble Mountain” off of China Beach. There have been a few extraordinarily magical places that we’ve come to, and that was one of them. It was a series of temples tucked into the caves found in the sandstone hill that had been there for centuries. It had both Champa and Buddhist influence, and was made entirely from stone, painted with moss, decorated with carvings and red sticks of incense, lighted with sun pouring in from holes and cracks in the ceiling –the walls spoke of all the people that had been there. There is poetry, both old and new, carved onto the stone; people’s names scratched into the moss. We found out that the place had been key for the VC and the GIs during the war. I am desperately curious to know what it was like to be a GI, and in a place like Marble Mountain, and to have your war be so starkly contrasted with one of the more spiritual places I’ve been too. Our guide had us climb to the top, which was referred to as “heaven,” and to then tell us that this was where many VC snipers were stationed until Americans used it as their helicopter landing pad. Sounds more like hell to me. Danang itself is really where BOOM was obvious—for the 20 km into town from marble mountain, dozens and dozens of hoity toity hotels and resorts were popping up on the beach, a stark contrast from the humble houses with corrugated tin roofs that we saw on the way. Central Vietnam used to be one of the poorest areas of the country, and was also one of the hardest hit during the war, and will soon be one of the more wealthy destination spots. Its safe to say, that in 10, maybe even 5 years, Danang will be a completely different place. However, if they plan on being a destination spot, they’re going to have to get used to women swimming in more scandalous outfits than jeans. And then to Hue! 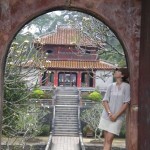 the imperial city of Hue… Stunning and touristy beyond belief—my favorite was the tomb of Minh Mang. We went right before sunset when the place was practically empty, and stumbled upon the filming of a popular Vietnamese TV show; surreal to say the least. On our last evening, we floated down the perfume river on a decorated boat with our own private concert of talented musicians trained in traditional music of the area. There is a non-definitive quality to the music here: it waivers and dances, yet everyone there knows exactly how and where the notes will go. All I can do is let myself succumb to the sounds and enjoy the wild ride. Needles to say, it was HUE cool.